Over the past two decades, video-assisted thoracoscopic surgery (VATS) has evolved from a diagnostic procedure to a treatment for complex lung cancer cases. VATS is now accepted as a feasible, safe, and effective surgical technique for the treatment of lung cancer . In fact, in current practice guidelines, thoracoscopic surgery is the suggested approach for the treatment of early-stage lung cancer [2, 3]. Decreased blood loss, reduced pain, shorter length of hospital stay, and fewer overall complications are just a few of the many potential benefits of this minimally invasive approach . 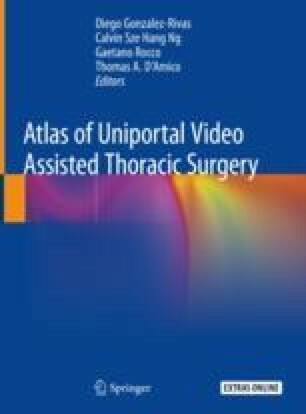 High-volume centers have not only evolved VATS techniques by performing more complex surgeries using VATS, but have also developed a new approach decreasing the number of incisions to one—the uniportal technique [5–7]. The online version of this chapter ( https://doi.org/10.1007/978-981-13-2604-2_21) contains supplementary material, which is available to authorized users. National Comprehensive Cancer Network (NCCN). NCCN Clinical Practice Guidelines in Oncology (NCCN Guidelines®). Non-small cell lung cancer. Version 4.2016. Jan 12, 2016. Abstract available at http://www.ncc.org/professionals/physician_gls/pdf/nscl.pdf.